It’s always great to recycle the everyday items around your house and turn them into something useful and beautiful. Here is a fun DIY project to make some cute decorative desk lamps using recycled containers. You can work with your kids on this fun and easy project. They will learn the concept of recycling and create some cute and beautiful home decors with their own hands. These cute little decorative desk lamps are great decors in girls’ bedroom. Happy crafting! Ornaments: beads, lace, ribbon, fabric flowers etc. Stack the three yogurt drink bottles on the tin can and secure with glue. These will be the base and rod for the lamp. Paint the base and rod in the color of your choice (white, brown, black, etc.) and let it dry completely. Wrap the instant noodle bowl with fabric and secure with glue. This will be the lampshade. Glue the ornaments to the lampshade. You can use any ornaments you like. There is no set rule how to decorate. Place the lampshade on the rod and a cute decorative desk lamp is done! 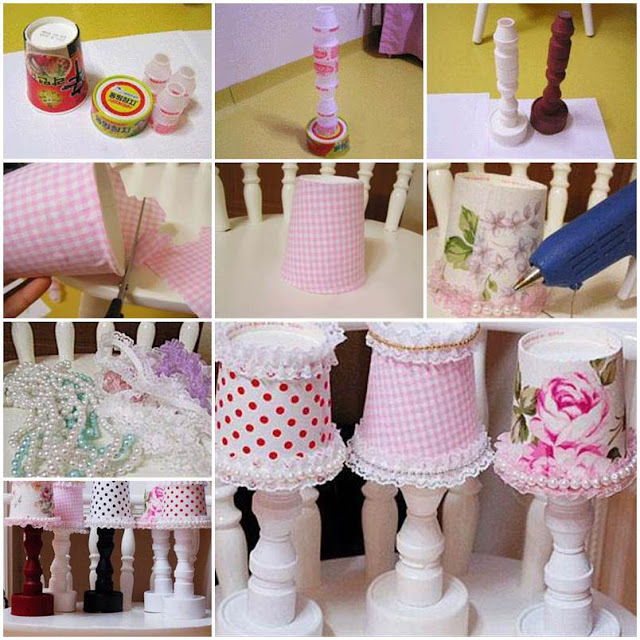 Repeat step 1 to 5 to make more desk lamps with different colors and styles. Enjoy!